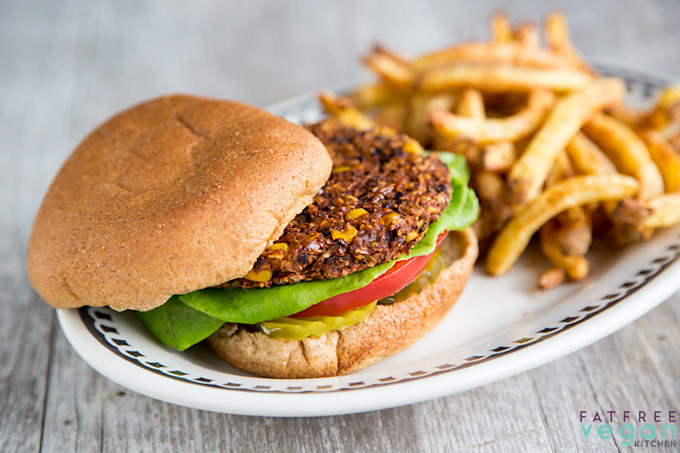 Vegan and oil-free, these simple black bean burgers are made with only 8 ingredients and can be on your plate in about 30 minutes. Gluten-free option, too! Let’s face it: When you follow a plant-based whole foods diet, there are some things you miss. I’m not talking about rich desserts and fried snacks. What I sometimes miss is the convenience of packaged foods, especially the ease of pulling a veggie burger out of the freezer and cooking it in the microwave in under two minutes. That’s why I decided to create a faster, easier black bean burger. Maybe I shouldn’t be confessing this on my food blog, but the older I get, the less time I want to spend cooking. Often, it’s just a mental hurdle—once I decide what I want to make and get into the kitchen, I enjoy putting a meal together, especially if my husband is available to help with the chopping. But for some reason, not having a child around to cook for has made me less eager to spend more than about 30 minutes on meal preparation. Maybe I’m just getting old; maybe I miss daughter E’s critical palate. Who knows? The upside is since she went away to college, I’m creating more Ridiculously Easy recipes for those of you who feel the same way about cooking. 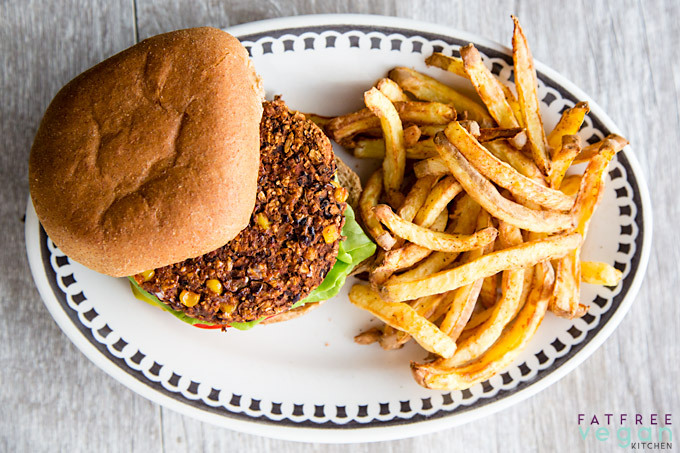 Like this recipe for 8-ingredient black bean burgers (7 if you skip the corn.) I have lots of incredible burgers in my archives, but all of them require some vegetable chopping or cooking some ingredients in advance. My African-Inspired Sweet Potato and Black Bean Burgers, for instance, are amazing, if I do say so, but they require cooking sweet potatoes and chopping 4 different vegetables. 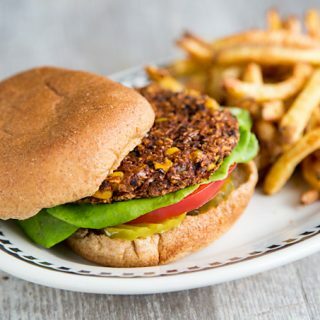 Instead of all that chopping, this easy black bean burger uses prepared salsa and just a few potent seasonings to create a burger that is firm yet moist, simple yet flavorful, in the least amount of time possible. I start by slightly grinding regular oatmeal so that some of it becomes powdery, helping the burgers stick together without added thickeners like flour or cornstarch. I’ve made these burgers twice now—first on the bake setting and then on the air fryer setting on my Breville Smart Oven Air—and they came out equally well both baked and air-fried. Since all of the ingredients are already cooked (or don’t require cooking, like oats and corn), they only need to be cooked long enough to crisp up the exterior and warm the interior; letting them “meld” in the fridge for at least 15 minutes insures that they will hold together. The second time, I treated them like regular old burgers and topped them with ketchup and mustard. I think you’ll love them with whatever condiments you use. P.S. I made the oil-free fries in my little Phillips air fryer, making this a two air fryer meal. I simply cut thin fries (I use a food processor) from Yukon gold potatoes, toss them with about a tablespoon of aquafaba (liquid from canned chickpeas) and some seasonings. Then I air fry at 360F for 18 minutes, tossing and stirring every 6 minutes. 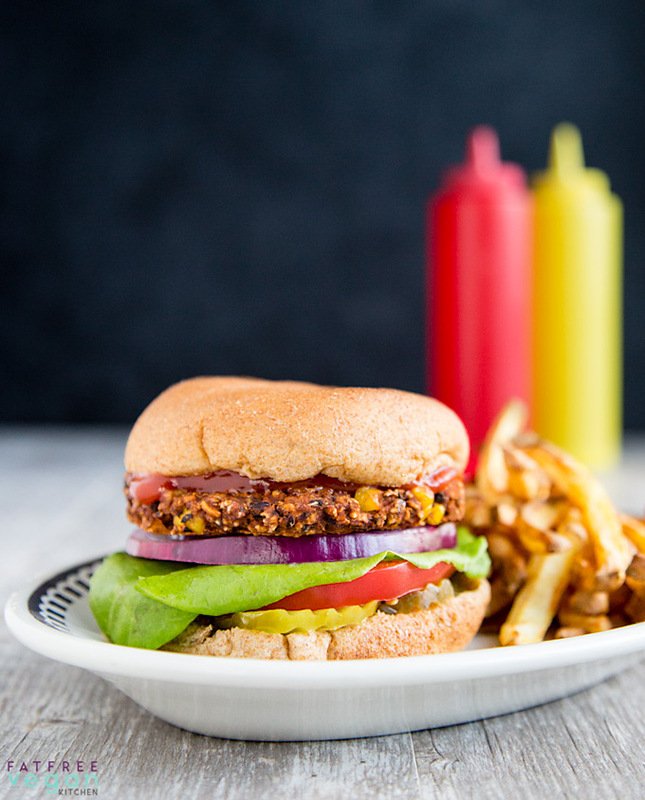 The chipotle chile powder gives these burgers smokiness with an edge of spiciness. If you'd rather them not be spicy, substitute mild smoked paprika. Place the oats in a food processor fitted with an S-blade and pulse 5 or 6 times until they are partially chopped (some will be powder, some will be whole.) Add all ingredients except the corn and pulse until most of the beans are blended. Pour bean mixture into a bowl and stir in the corn. Cover and refrigerate for about 15 minutes. Preheat oven to 375F. Line a baking sheet with parchment paper. Form bean mixture into six patties using a scant 1/2 cup for each. Bake for 20-30 minutes, being careful not to overcook and dry them out. They're done when the outside is beginning to get crispy and they hold together well. These are easy to freeze either baked or unbaked. Just shape the burgers and wrap them tightly to store in the freezer for about 3 months. 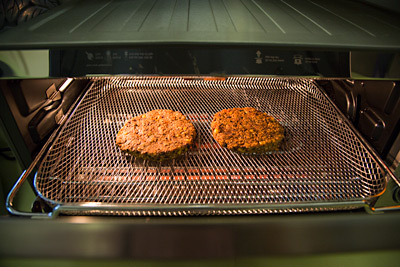 Thaw unbaked burgers well before cooking. Each burger is 2 Weight Watchers Smart points. Links to Amazon.com are affiliate links to products I bought with my own money. When you buy something through my links, I receive a commission that helps support this site at no extra cost to you. Thank you for your purchase! What a delicious recipes you always place on your website. Where do you, if I may ask, get these ideas? Let me know if it isn’t one of those and I’ll keep looking. Thank you for trying. it’s neither of those burgers. I’m starting to think I’m confusing websites but because yours was one of the first I followed when going vegan (and I love your recipes! ), I thought I had the recipe from here. I remember a blog post about black bean burger that referred to an older recipe and I then followed that link. I somehow preferred the older version haha. But this one is very close to what I remember so I will go with that. Thanks anyway! Love these burgers! So easy, just the right amount of spice, and healthy to boot! I also love these burgers, they are simple to make and absolutely healthy. I will definitely use this recipe sooner or later. I have a question.. what type of bun are you suggesting since this is a vegan burger? Any bun without dairy and eggs in it. Most supermarkets have several options.